I’m really excited about this one! 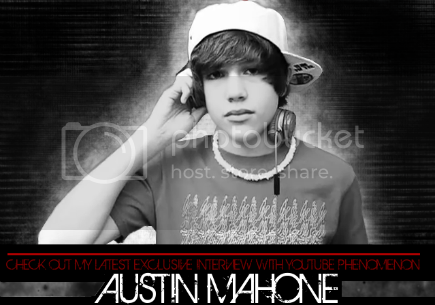 This One-On-1 Exclusive features 14-year-old singer and Youtube phenomenon, Austin Mahone! After only one week of posting Youtube videos, Austin had already racked up 700 subscribers, and after a month that 700 subscribers turned into 5,000, making him the number 1 musician of the month! Austin is definitely on the rise to fame, and he took time out of his busy schedule to chat with me! Read on to learn more about Austin Mahone! Austin! I can’t thank you enough for chatting with me! I’m so excited to have you! Thank you so much for giving me the opportunity to visit with you and to be on your website! My pleasure! Now as you know, I have a lot of questions for you! For starters, how long have you been singing and what inspired you to start? I have been singing for as long as I can remember but really starting to have dreams to pursue music a couple years ago. I was also inspired by Justin Bieber with his incredible talent and his love for music as well. Yeah, Justin is phenomenal! He pretty much took over the world in 2 years (lol)! I’ve noticed that you cover a lot of his songs, what is it that you appreciate about his music? He is multi talented and made his dream come true with hard work at a young age and has earned the respect of so many other artists. Also, I think his voice is amazing and his songs are so catchy they just touch me. True, I find myself singing “Baby” more times than I’d like to admit! So, what is your favorite genre of music, and who are some of your favorite Artists? I love Hip Hop, but my favorite is Pop. My favorite artists are Justin Bieber, Ne-Yo, Chris Brown, Usher, and MJ. Alright! You’re taste is pretty eclectic, which is awesome! Now, is music something that you would like to pursue professionally? What are your dreams for your career? Yes, that’s my dream and goal in life. My dreams for my career would be to travel the world and to see new places when I perform for people that love my music. It will definitely happen for you Austin! You seem so mature, do you have a strong support system backing you? How does your family feel about your decision to pursue music? Yes I have a wonderful Mom that supports me in everything I do. I'm also very close to my Grandparents who always have encouraged me. That’s great Austin, they’ve obviously done a great job making an impact in your life. I wanted to ask, you became really popular on Youtube very fast. How did you market yourself? Wow, so you really invested in Social Networking, an obviously effective method (lol). Do you have anything big and exciting coming up in the near future? I am excited to participate in the upcoming YouTube event, Playlist Live in Orlando, Florida. I'm also continuing to work on some more videos including an original. Wow! That’s great! I’ll be on the lookout for that! Playlist Live? That’s really exciting! Great things are in your future Austin! I’m not going to keep you too much longer, I just have a couple more questions. What would you say to another kid wanting to pursue a career in music? I would say to go for it! Never ever give up on your dreams, and to sing or play their instrument like nobody is listening. Also that we all have haterz and we just have to ignore them because they're probably just jealous or upset with themselves and are probably just taking it out on you. Just block them out, and look at your awesome comments that say you're amazing and to live your dreams because they know you will make it someday. That is what keeps me going. That’s an awesome answer! Every kid needs to hear that, regardless of the profession that they choose. So Austin, for my last question I’d like to know, what is your greatest ambition in life? That would have to be making a successful career from music and possibly working with my inspiration, Justin in the future. Also, traveling the world, seeing new places and performing up on stage. You are truly an inspiration Austin! Thank you so much for chatting with me, I’ll definitely be on the lookout for all of your upcoming projects, and please keep me updated on your success! Everyone be sure to connect with Austin on all of his Social Networks! Check out Austin Mahone's cover of "I'll Be" by Ed McCain! I heard you sing the Trey Songz song. Dope! I love Austin Mahone. Lol. I love you! (as a fan!) When you sang trey songz it was pretty dope! austin mahone is amazing and he inspired me so much to not be afraid to be who i am . and if i hadn't discovered him i would still be sitting doing nothing being afraid of everything & everyone . <3 i love him ! i fricken love this kid . his voice is amazing . i haven't gone without listening to him . Hes really good but he needs to remember the awesome god who gave him his talent! Austin Mahone is amazing. If Justin Bieber ever got the chance to meet this kid. He would soo want to do a collabaration(: But anyway, if Austin ever becomes famous I want him to stay grounded and not get sucked into the Limelight.. I go to school with him :) He;s really good! Im your fan since i saw you on youtube. In school we named a team after you. Hey Austin You Have Inspired Me To Not Be Afriad To Sing In Front Of People!And Now I Am Facing My Fears And Making MOre Videos Of Me Singing On Youtube! THANK YOU!